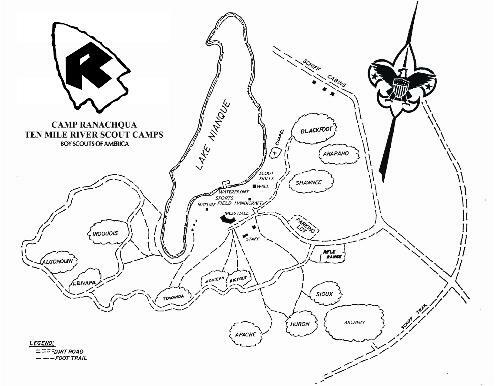 Troop 206 attends Summer Camp at Camp Ranachqua located at Ten Mile River. Camp Ranachqua offers all the resources you'd expect from a 12,000 acre scout reservation with the personal attention and atmosphere of a much smaller camp. 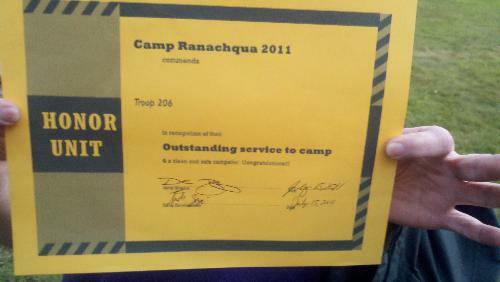 The combination of these elements make Ranachqua the perfect destination for you and your troop this summer! Lake Nianque serves as home to the most dedicated, spirited and knowledgeable staff around. We know that as Scouts we all look forward to summer camp as the pinnacle of our year and if you and your troop are looking for a place to call home look no further than Camp Ranachqua! Travel on Route 17 to exit 104 (Monticello Raceway). Travel on 17B for about 6.7 miles into White Lake and blinking light. At 0.7 miles beyond the blinker, make a left hand turn on Route 55 West. Follow Route 55 for about 4.1 miles to the Ten Mile River Camp cut-off on the right hand side which is Crystal Lake Rd. (County Route 26). Follow Crystal Lake Rd for approx 3.3 miles to a sharp left turn in the road. At the sharp turn take the dirt road on the right. Follow the signs to Camp Ranaqua. Click here! Directions to the campsite will be provided in an email. This is only a suggested list. Check it carefully, change it as you see fit, and make copies for all your Scouts. All items should be labeled with the Scout’s name. on Sunday to take the swim test. † Also available at the Trading Post. atmosphere that should prevail at camp.